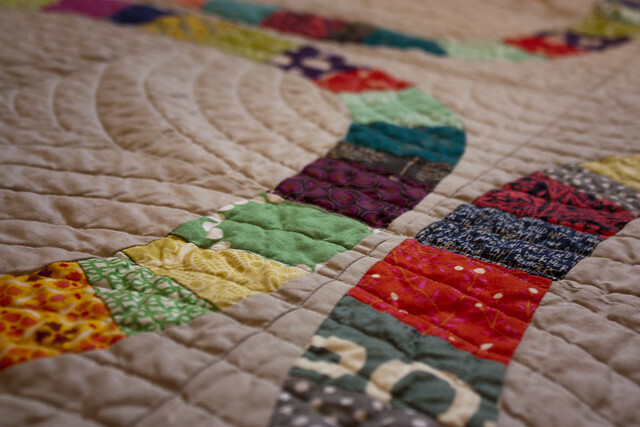 Denyse Schmidt's Single Girl quilt has been on my bucket list ever since it first debuted. The curves always intimidated me, so it kept moving to the bottom of my to-do list. 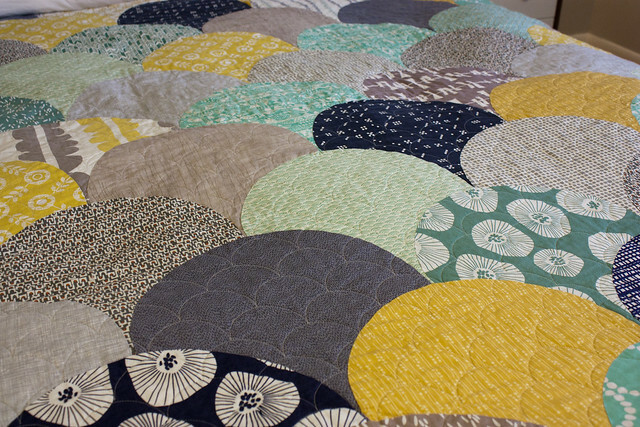 When I finally got comfortable with curves while sewing the Glam Clam Quilt, I had more confidence to tackle this project. 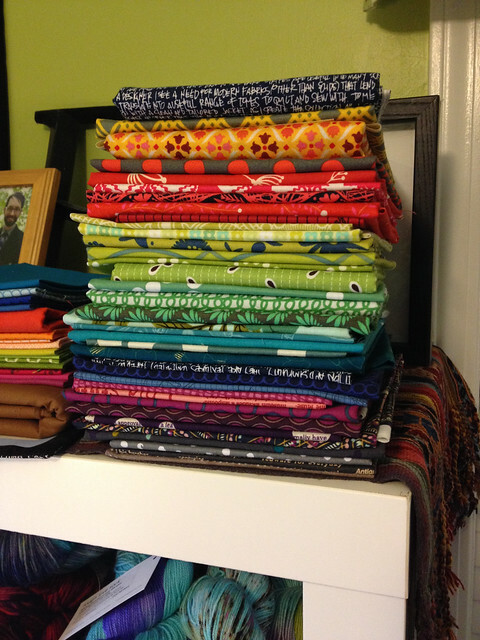 I pulled together an assorted rainbow of prints and paired them with a Moda Bella Solid grey. The biggest timesaver for this project was purchasing a set of template plastics from Custom Plastics on Etsy. These templates made the cutting process so simple and were worth the money. 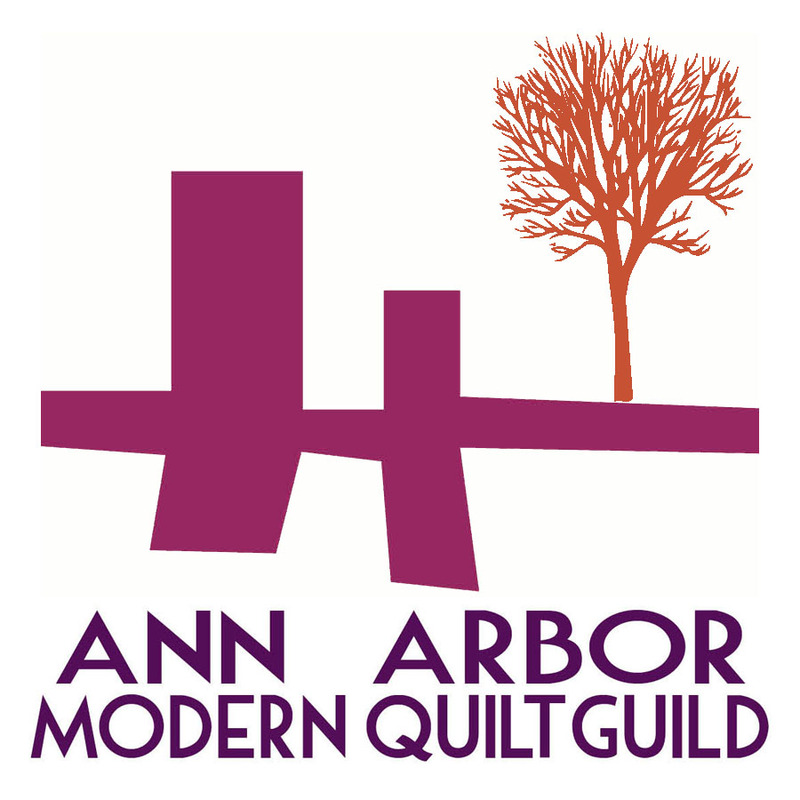 I pieced this top during the Ann Arbor Modern Quilt Guild retreat in January. It was super tedious to piece each block and I was thankful for the great company because it helped me to plow through the task at hand! At the end of the retreat, I sent it home with Kathy Koch of Threadbear Quilting for longarm quilting. 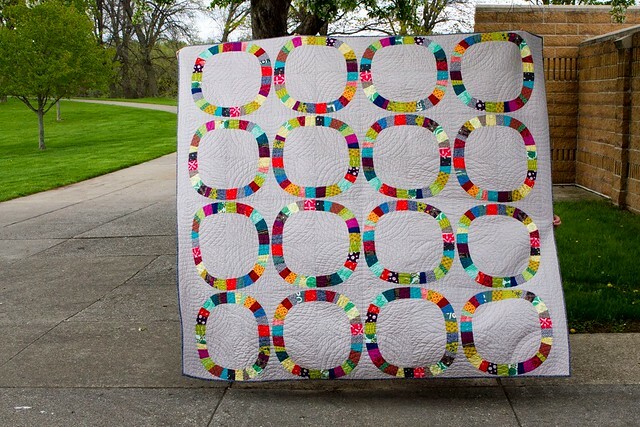 She is so great to work with and ended up creating a custom quilting pattern based on the hand quilting template included in the Single Girl pattern. 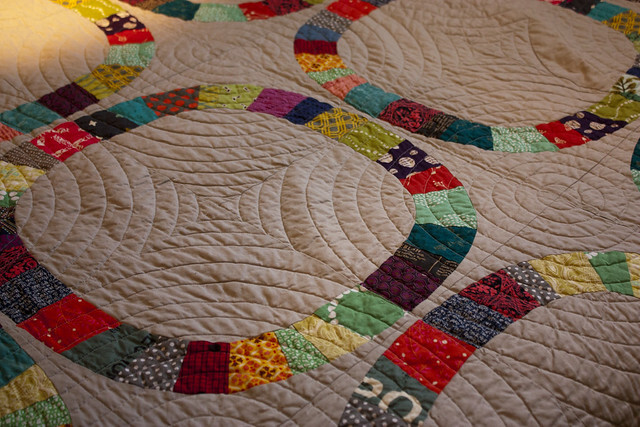 When I first saw the finished quilting I was in shock at how amazing it looked. My favorite detail on the quilt is the navy architextures text print on the binding. Koko also approves! 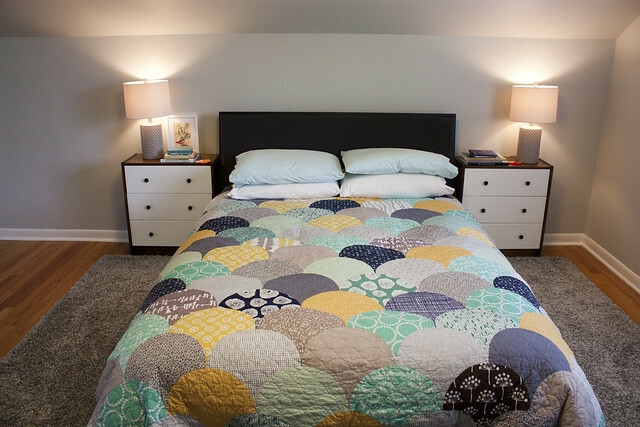 This quilt is happily living in our guest room on this vintage bed frame my mom found while thrifting. 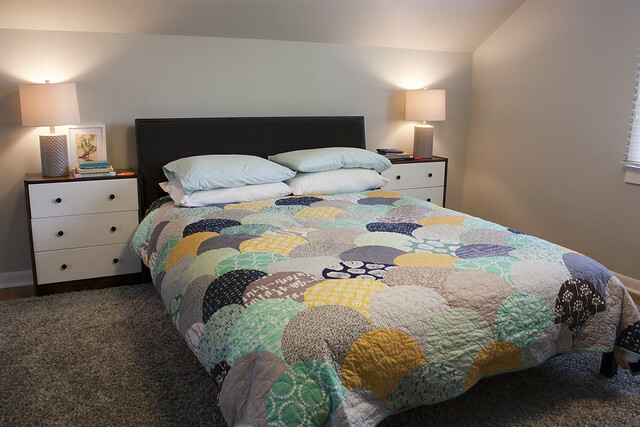 It's so nice to be able to display these large scale quilts in our home. 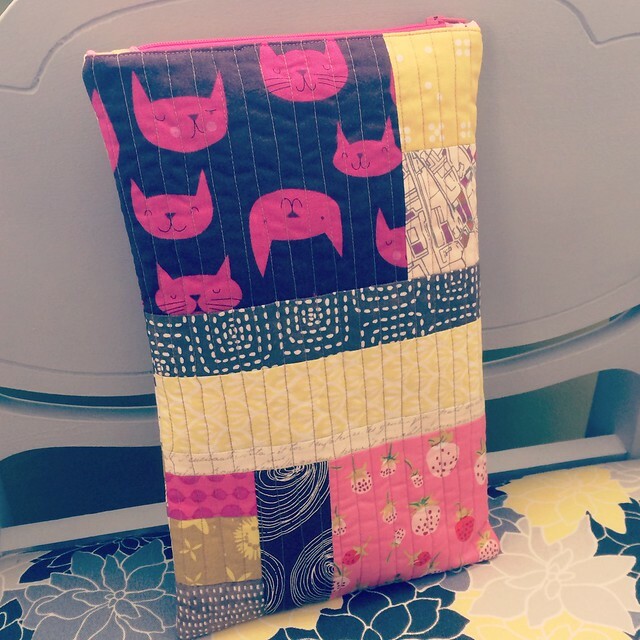 Here's my large quilt entry for Amy's Blogger's Quilt Festival. and 3. Discovering this amazing Glam Clam pattern. 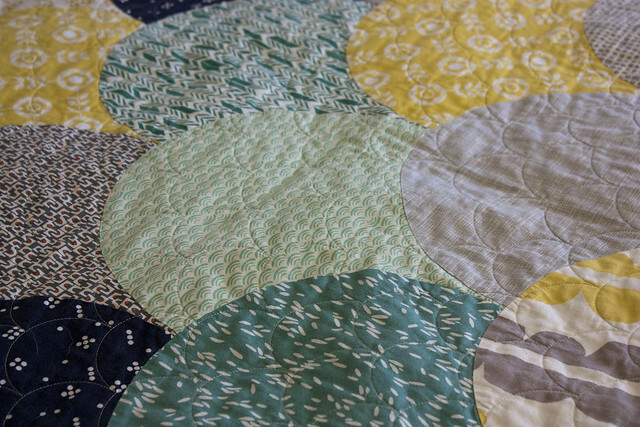 This quilt came together because of the inspiration I saw in Grand Rapids, the awesome opportunity to actually match fabrics together in person and overcoming my fear of curved piecing. 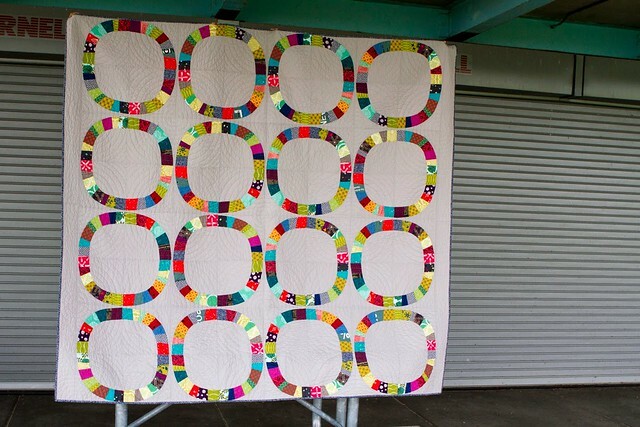 Latifah has a great video tutorial on piecing curves without pins here. 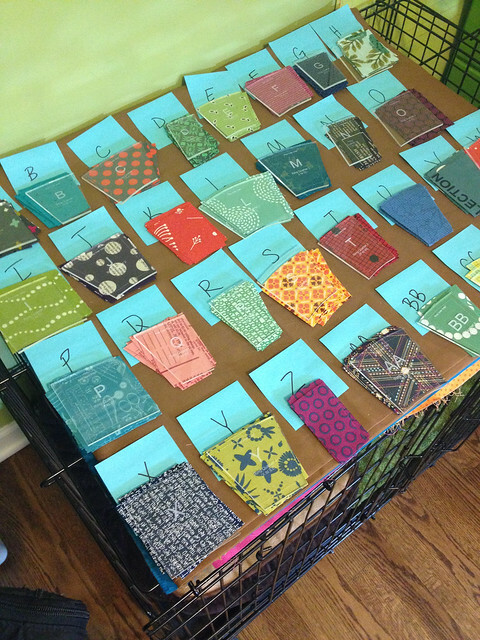 Her patten is genius and was a great way to reintroduce myself to the world of quilting and fabric selection. I'm so glad I was able to find such great inspiration to get me excited by this hobby again! 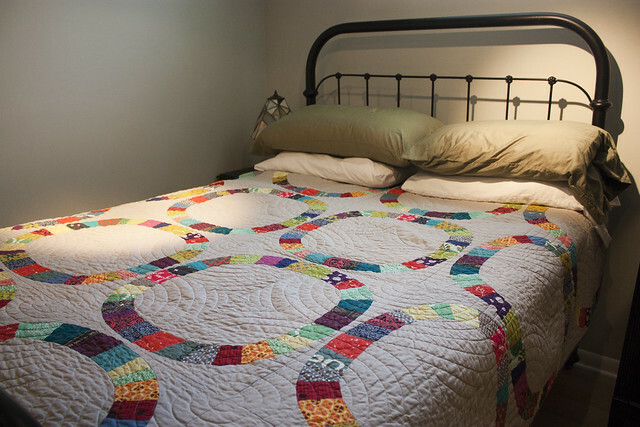 The quilt was quilted with 2" clams by Kathy Koch of Threadbear Quilting. She is wonderful to work with and always has great ideas for enhancing the quilts I make with her quilting skills. Because this is a queen-sized bed quilt intended to keep us warm during the coldest of Michigan winters, I made this quilt into a duvet. Liz at Lady Harvatine first gave me the inspiration with the quilt duvet she made for her sister. 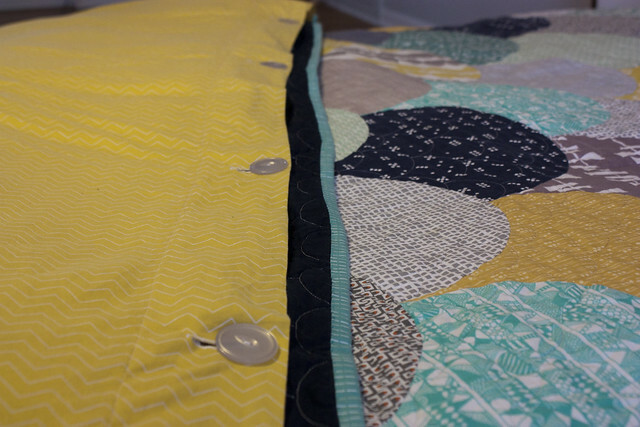 Before binding the quilt, I pieced another solid quilt back with a finished edge on the short side and 6 button holes. I attached the binding around the quilt top, batting, original backing, and duvet backing, leaving an open side on the bottom. 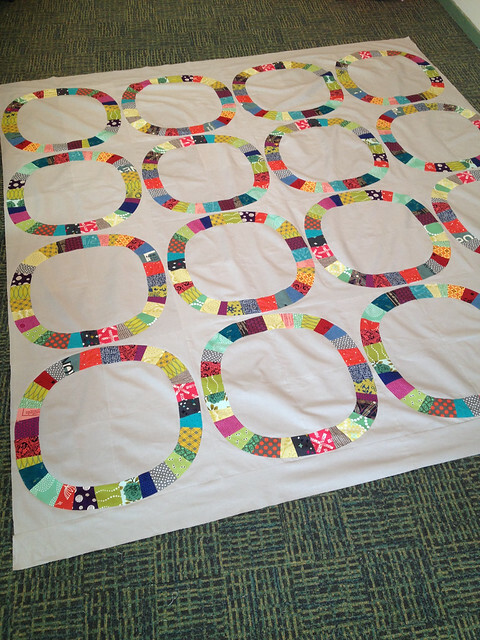 Once the backing was attached, I sewed the buttons to the original three layers of the quilt. 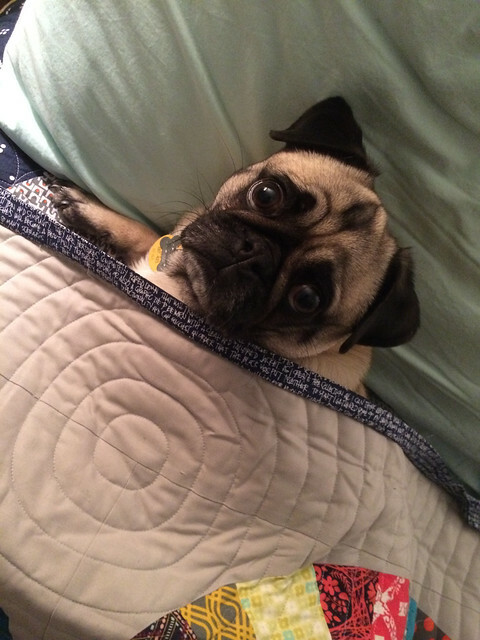 In the winter, we add our down comforter, and when summer comes, we can remove the comforter and have a lighter weight quilt for our bed. To see a gallery of the other quilts I've made, click on this link, or click on the Quilts page at the top of my blog. Over the past year, glimpses of cute cross stitch designs on Instagram have slowly been luring me into trying a new hobby. For some reason, cross stitch never really appealed to me. 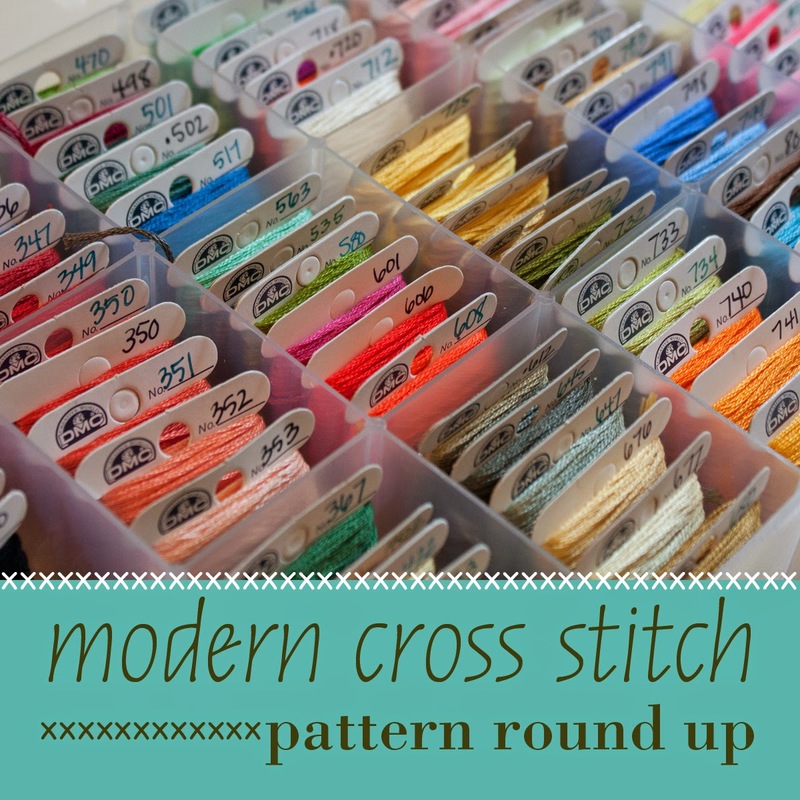 I think I was intimidated by the tiny grids and exact patterns, not to mention the thought of starting another craft stash. Now that adorable designs are more plentiful, it was harder and harder for me to resist. I finally caved a few months ago and I'm completely smitten. I'm drawn to the thrill of slowly seeing a pattern emerge and being able to mindfully finish a design stitch by stitch (kind of like colorwork knitting). Being able to buy a pattern and supplies to finish a project for under $20-30 isn't too bad either! The company that started it all for me. I'm anxiously awaiting their new Cherry Blossom design. I'm not a Halloween fan, but their adorable Frankenstein in the Mysterious Halloween Town Club is calling my name. I just started her Pretty Little Tokyo design. Her color sense is impeccable and designs are adorable. I'd love to stitch up every single one of her designs. I heart their kitchen gadgets and cuckoo clock designs. Lots of cute, smaller designs. 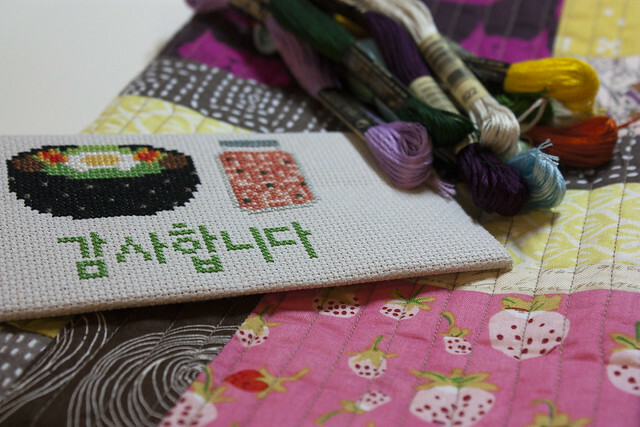 I combined the Bibimbap, Kimchi and Korean Thank You designs to make a thank you card cover. I'm not sure if I'd ever be able to stitch up one of these Bad Grammar Series designs due to OCD, but I am such a fan! I check these out digitally from my library's Zinio magazine collection (check to see if your local library subscribes!). I've had the best time poring through the last 10 issues of designs. Lots of great contemporary designs in all sizes. Each issue has a basic getting started guide with great pictures. 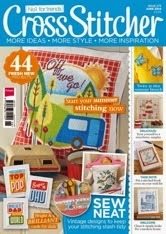 I discovered this British designer through Cross Stitcher magazine and she's my new favorite. Her typography, pretty colors and fresh designs are so adorable. I want to make one of each of her designs. 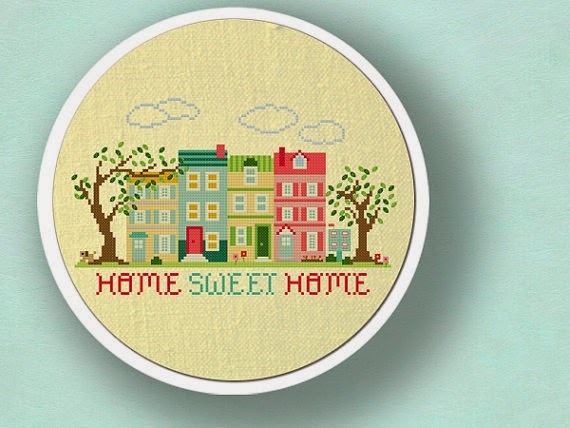 I've started a Cross Stitch board on Pinterest for more inspiration. I'd love to find more great designs. Please comment if you have any favorites (or have a pinterest board you'd love to share)! 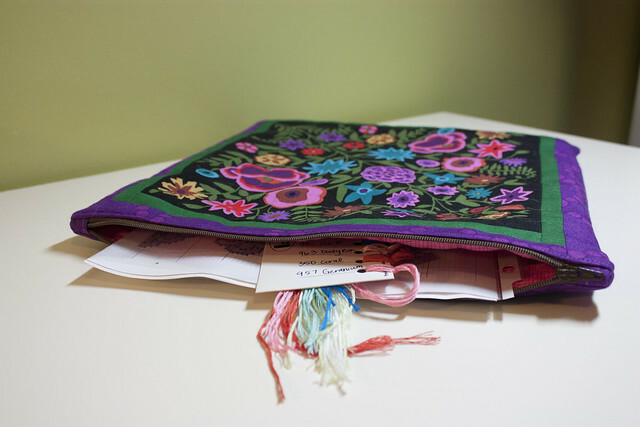 And, last but not least, I put together two zipper pouches to hold cross stitch projects. I have been trying for years and years to make a pouch with a crisp right angle next to each zipper. This tutorial from Jedi Craft Girl finally clicked for me when she pointed out that you should clip the zipper next to the seam before flipping right side out. 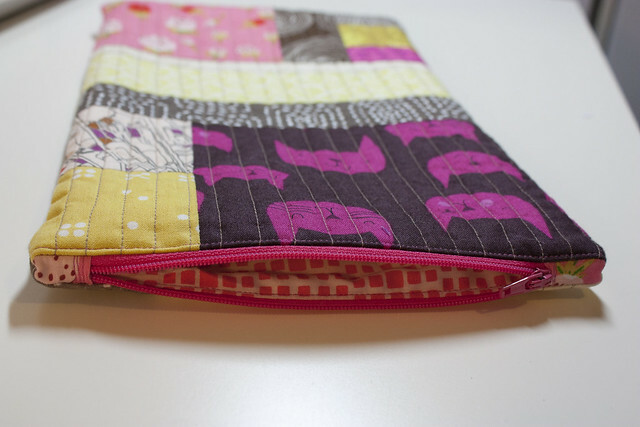 I now have 2 new pouches with beautiful corners! 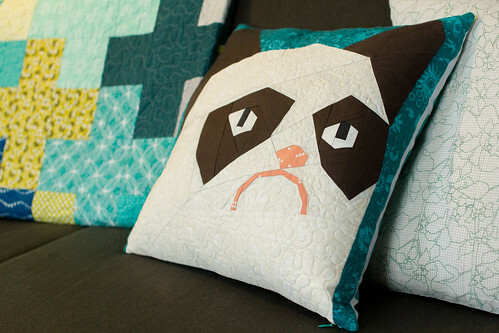 When Sarah and her husband bought a new house this winter, I knew I had to make her a Grumpy Cat pillow for her new and improved sewing room. It was a brutal winter and Grumpy Cat is the perfect spokescat for the Polar Vortex. 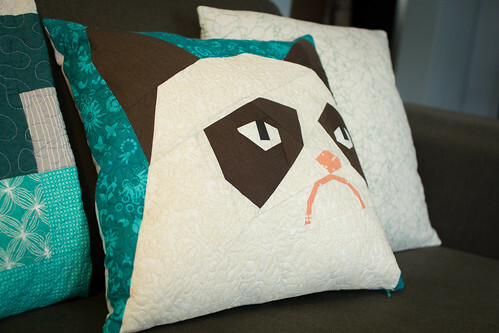 This paper-pieced Grumpy Cat pattern is from Sew What Sherlock (who also made the adorable llama pattern. My version here). My only change was to use peach for the nose and mouth rather than black. I quilted the cream parts with cream thread and the teal parts with teal thread and left the eyes and ears alone (which you should also do with real cats!). I backed it with this Lotta Jansdotter Mormor print. I love this print so much that I had to hoard another yard after using up this fat quarter! 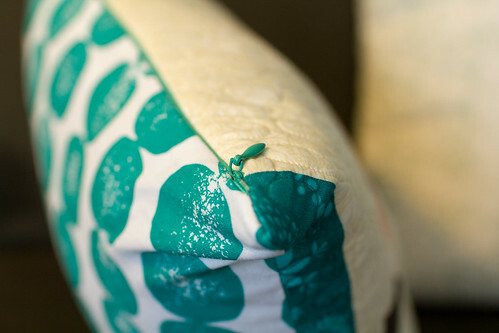 To finish off the pillow, I installed my first invisible zipper, thanks to a wonderful tutorial by Sew Katie Did. 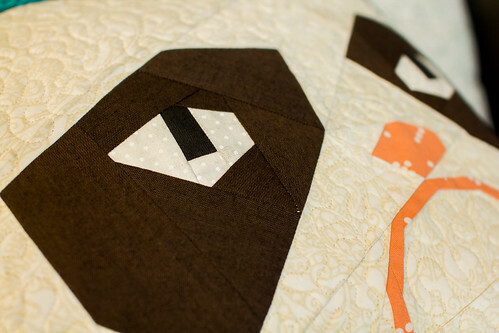 I'm so glad I gave paper piecing a try last fall. 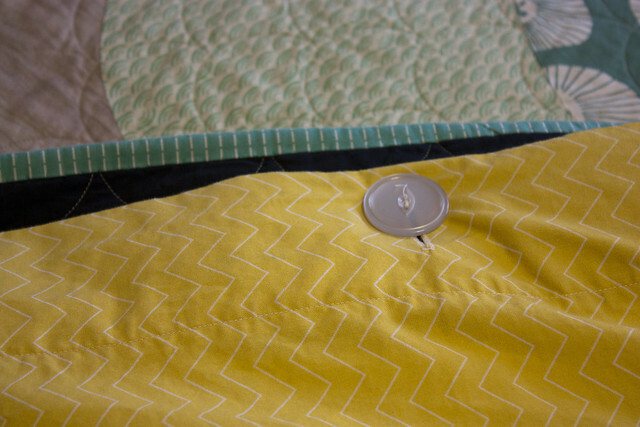 It's such an easy way to follow a pattern precisely and make all seams and edges line up. 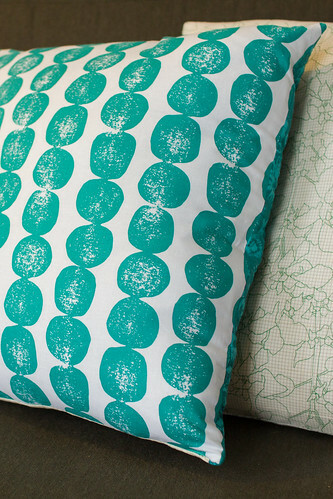 I'm on the lookout for more adorable patterns (like this Totoro pattern) to turn into pillows.